Gorgeous, isn’t it? You are probably thinking yes, but too difficult for me to make. So many times cooks, and non-cooks alike look at a photo of a beautiful dish and because they assume it’s complicated to make, just skip it. 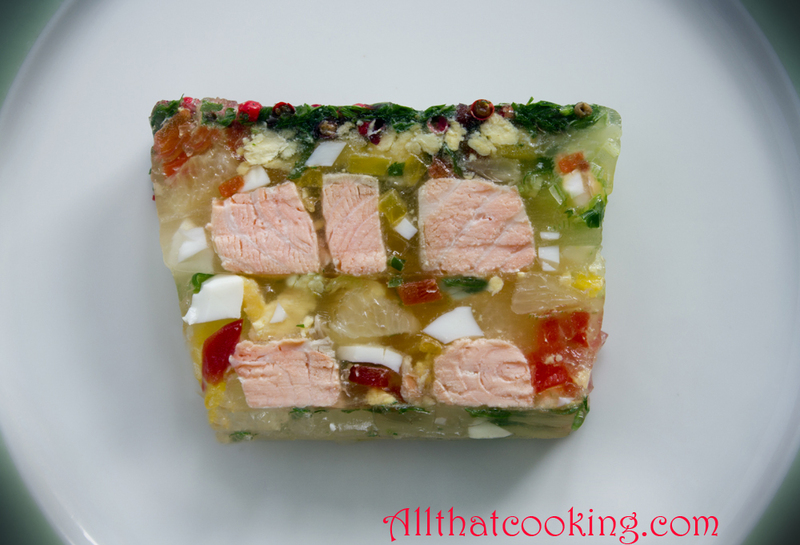 A couple of people saw the preview photo for this salmon terrine and had just that reaction. Well, surprise – it’s mostly prep work! How hard is it to chop some eggs and veggies, steam some fish, dissolve some Knox gelatin in a glass of wine and follow a few simple steps that culminate in oohhs and aahhs when you present an aristocratic salmon terrine to start your meal? Oli prepared and photographed this in Sweden and asked me to replicate it in Virginia Beach, so I can tell you first hand it’s pretty simple. Just set some time aside for the prep and be organized. The rest is a breeze. What I found most challenging was sectioning the lemon! Yeah, cutting between the membrane wasn’t easy. My results were not perfect but I managed. Some people look for short cuts – here are a few to make it even easier. Everything needs to be cold when you assemble the terrine. You can make the hard boiled eggs in advance. If you don’t want to roast the bell peppers, pick up a jar in the grocery store. Just be sure to blot them very dry before using them. (Jarred peppers are pricey but quick. Personally, I love the aroma of fresh peppers roasting in my kitchen.) You can chop the scallions and parsley in advance as well. Salmon – sure, do that the night before. You could refrigerate everything in individual foil packets or small bowls until ready to use. Oh, and yes, by all means pick up a box of fish stock from the soup section of the grocery store. 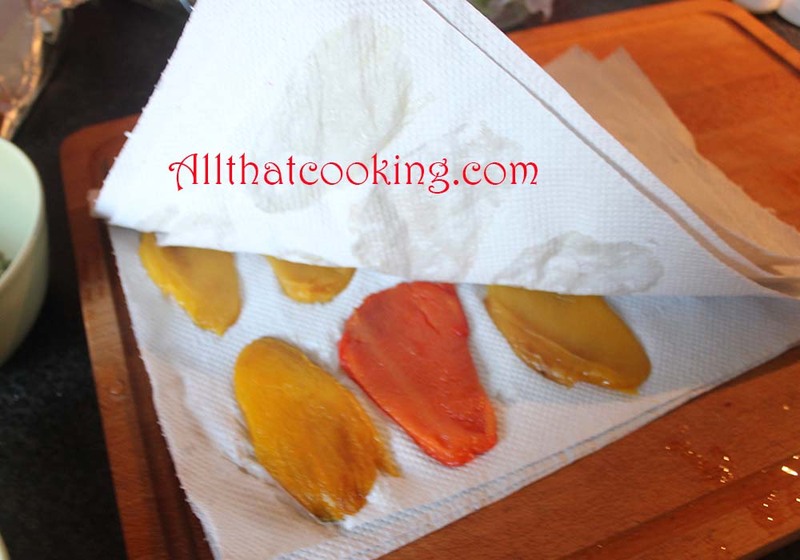 Take a look at the photo – all you are doing is making several layers of gel on which you are layering jeweled tone veggies and summer pink salmon. 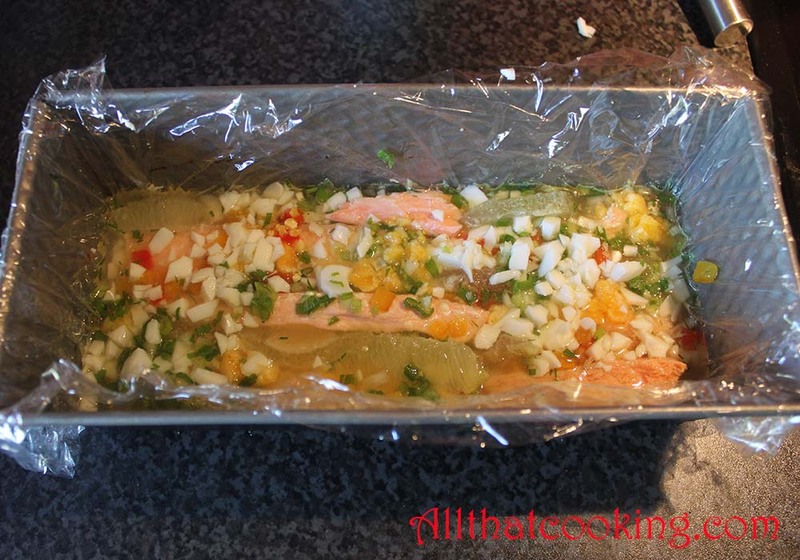 Oli’s summer salmon terrine is quite healthy – low cal and low carb. With every bite there’s a new surprise. Fresh ocean taste of salmon, sweetness from bell peppers, creamy texture of hardboiled egg bits, freshened with a bite of citrus (that never makes your mouth pucker), clean parsley, a slight bite from a peppercorn and maybe some scallion. All surrounded by a subtle, wine scented fish gel. This salmon terrine is the quintessential summer time starter. Pink peppercorns, also known as red peppercorns, do not have a strong peppery bite. They taste a bit fruity, and have a mild hotness. If you are unable to find them, substitute green peppercorns which are available in the spice section of most grocery stores. 1. Cut salmon into long strips. If your piece of salmon has skin, remove the skin after steaming. 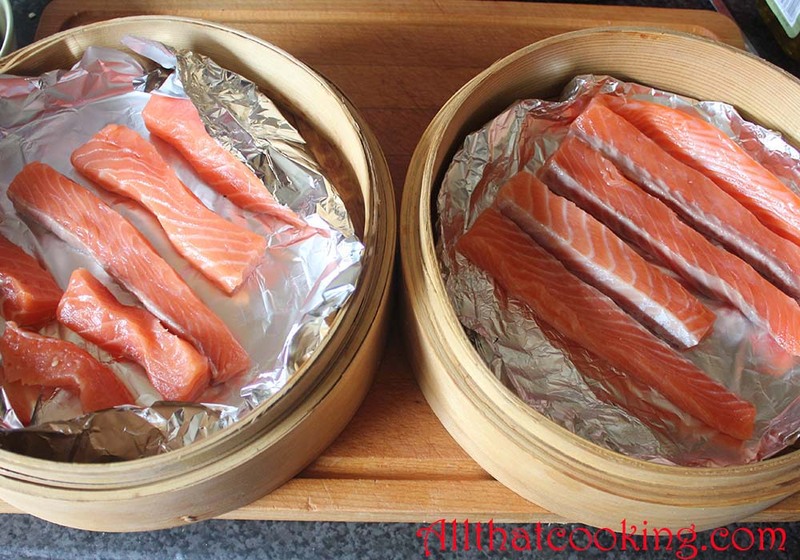 Line a steamer basket with lightly oiled foil and steam salmon for 10 minutes. 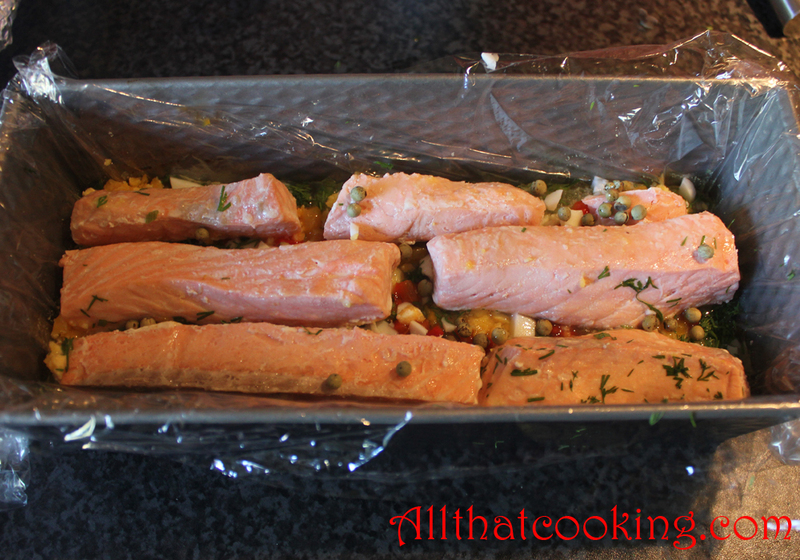 Alternately, place salmon strips on a lightly greased tray and bake for 5 minutes at 375F, or until salmon is cooked. Dry well between paper towels. 2. Make the hardboiled eggs. When cool, peel then separately chop the yolks and whites. Place in individual bowls. Refrigerate until using. 3. 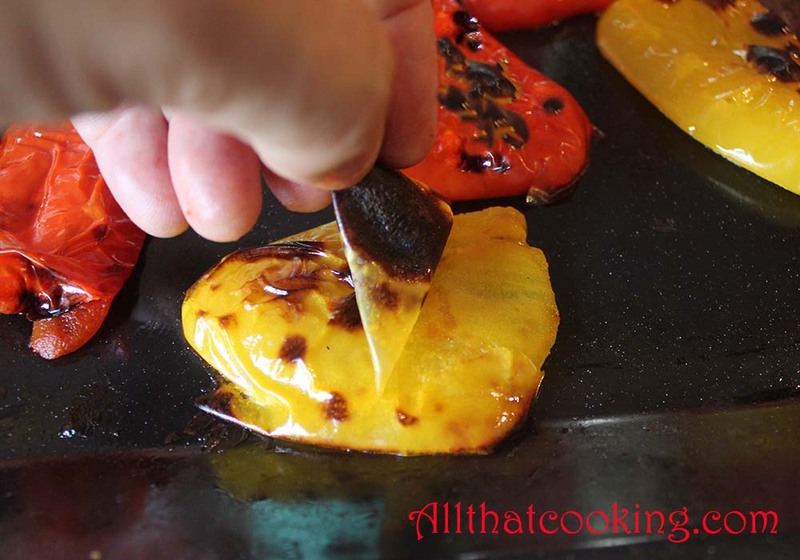 Roast and chop the bell peppers. Core peppers and cut lengthwise into 4 pieces. Place skin side up on an oven proof tray. Lightly brush with olive oil. Broil for about 10 minutes or until skin is black and bubbles. Remove from broiler and cool. Peel off the skin and pat the peppers dry with a paper towels. Finely chop peppers and place in individual bowls. Refrigerate until using. Use a sharp knife to cut off the ends of the lemon. Stand the lemon on one of the flat ends. Cut from top to bottom, taking away a section of the peel and white pith. You will see the lemon sections. Continue to cut around the lemon. You do lose some of the fruit in order to remove all of the peel and pith. When all of the peel and pith have been cut away, hold the lemon in your hand and cut between a section and the membrane that separates it from the adjacent section. Cut all the way to the center of the lemon. Move to the other side of the wedge and the membrane and cut the same way. You should now have a wedge of lemon. Cut the next wedge and continue with the remaining wedges. 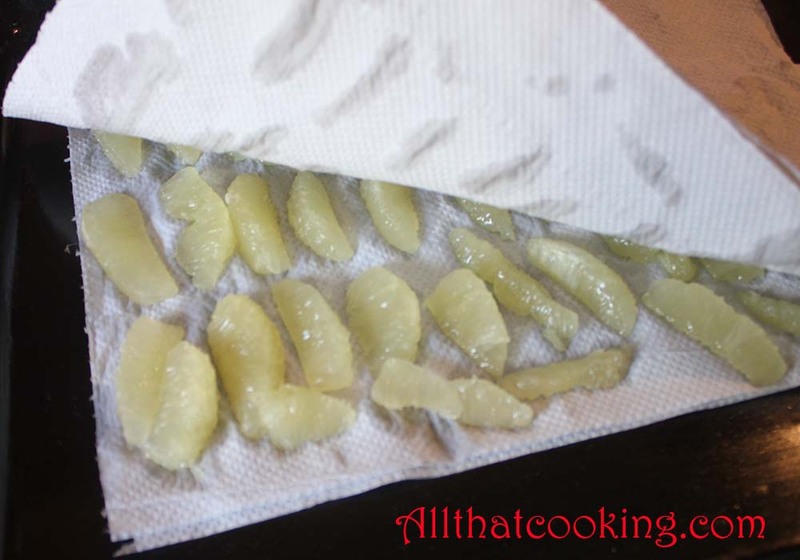 Place the wedges between paper towels and blot dry. 5. Finely chop scallions and parsley. Place in individual bowls. 1. Dissolve gelatin in wine. 2. In a medium sauce pan bring the stock to a boil. Take pan off the heat and stir in the gelatin/wine mixture. 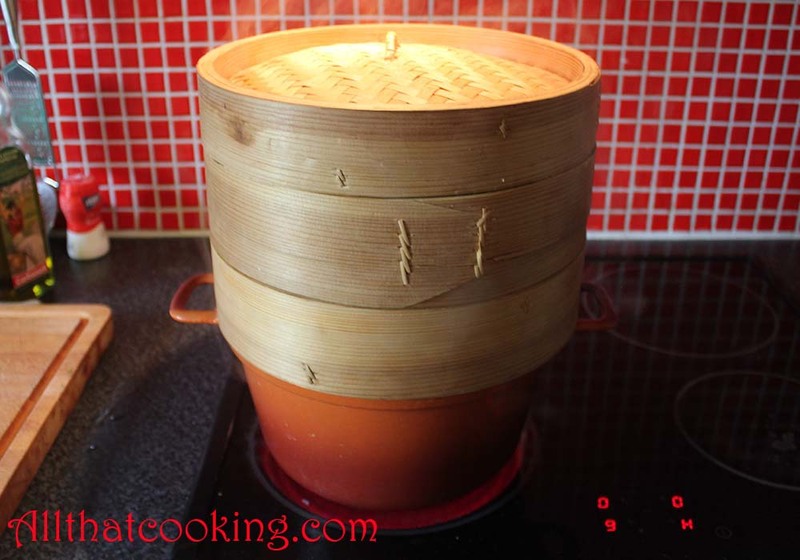 Put a lid on the pot and cool to about room temperature. This shouldn’t be too hot or too cold. If it starts to gel before you use it, just warm it up again. 1. Line a 4 cup loaf pan with plastic wrap. 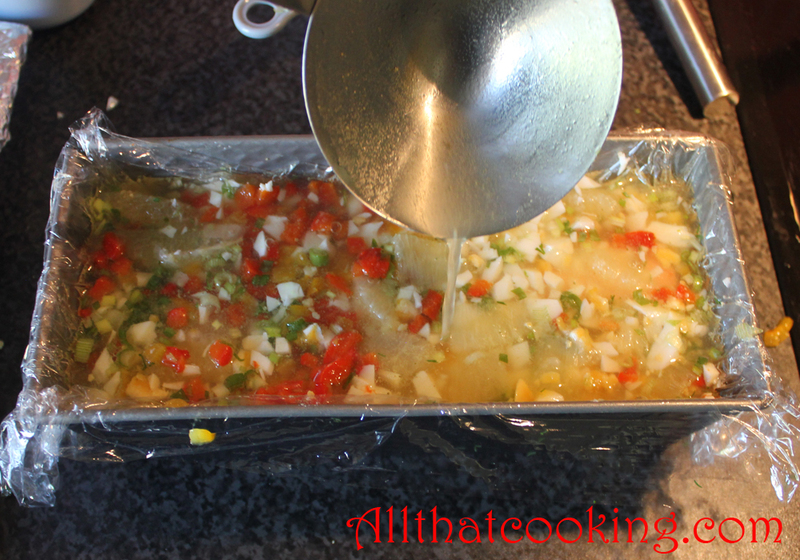 Make one of the long sides long enough to cover the top of the pan. (This will help when cutting the terrine for serving.) Pour in 1/2 cup of the stock. 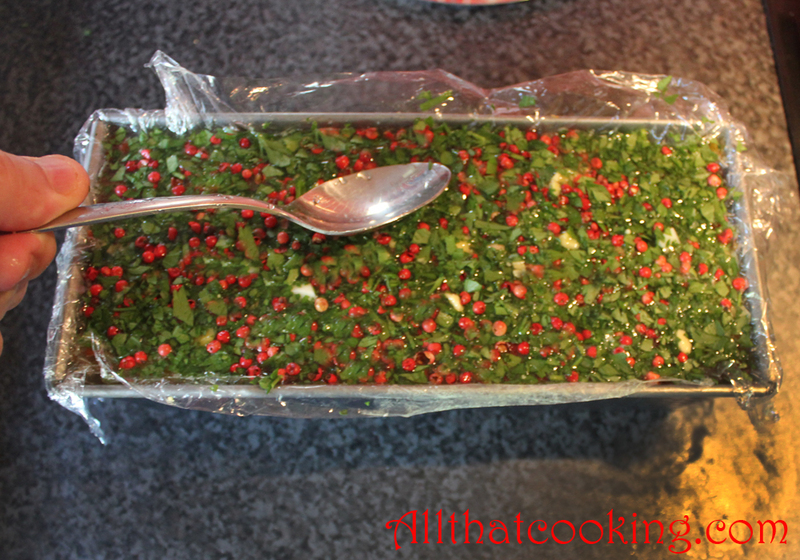 Sprinkle a few egg whites and some parsley on top and place in the freezer for about 10 minutes or until the gel sets. 2. Remove the pan from the freezer. 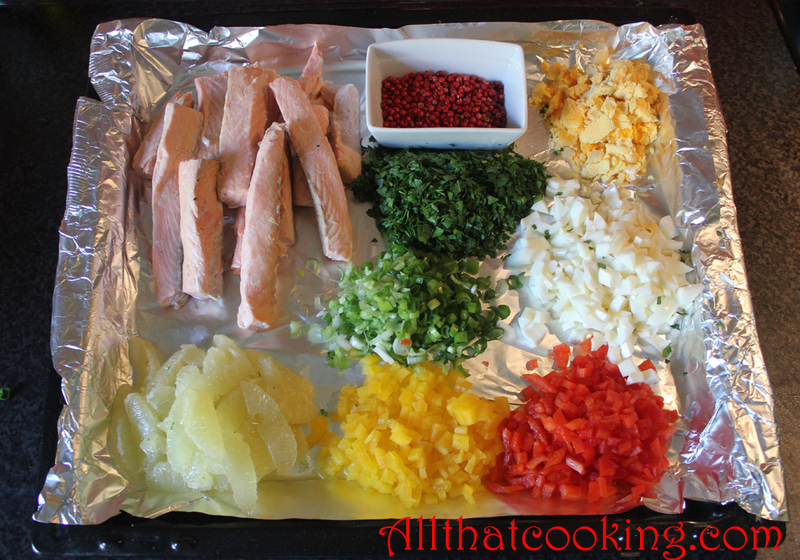 Arrange the salmon stripes on the gel, keeping them in the center, away from the sides of the pan. 3. Sprinkle in half of the peppers, half of the egg whites and half of the yolks. 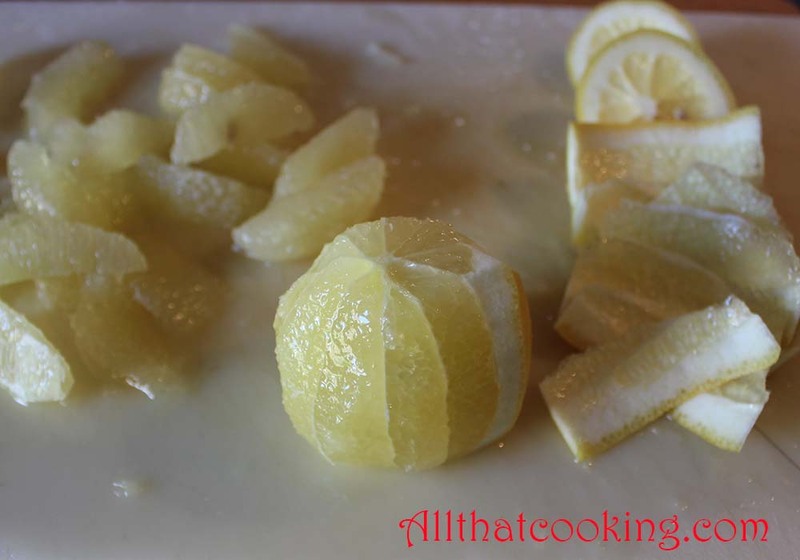 Arrange half of the lemon wedges in between and around the salmon laying them lengthwise. Sprinkle in half the scallion and just a little of the parsley. Note: Be careful when working with the egg yolks. They are delicate, so once you have them scattered, don’t move them around because they will disintegrate. Pour in enough stock to cover this layer. Return pan to freezer for about 20 minutes or until gel sets. 4. When set, remove pan from freezer and sprinkle in the rest of the eggs, lemons, yellow bell peppers (not the red) and scallions. Pour in stock until everything is covered. You might have a little stock left over. 5. Sprinkle red bell pepper, peppercorns and parsley evenly over the top. Lightly press them down so that everything is covered with stock. Refrigerate for at least 8 hours until set. Remove loaf from pan keeping plastic on. To slice, use a very sharp knife and saw through the plastic. Cut confidently, but carefully! Remove plastic from slice. The gel tends to soften quickly, so be sure to keep the loaf cold when cutting and serve immediately. Serving each slice on a chilled plate would be a nice touch. Gallery | This entry was posted in Starters and tagged cold salmon, easy salmon recipe, easy salmon starter, elegant, low cal salmon, low carb salmon, salmon terrine, summer salmon recipe. Bookmark the permalink. 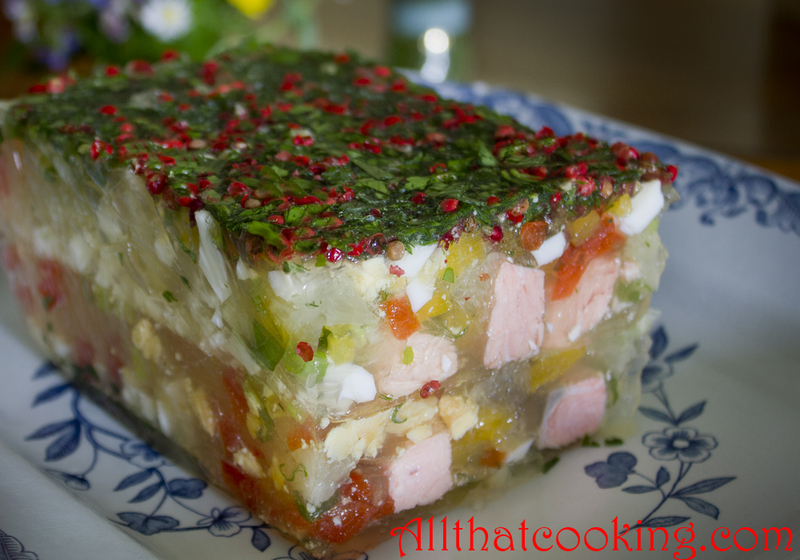 What a sophisticated gourmet terrine! The Summer Salmon Terrine looks irrestitible in the pictures and i know Oli is very good with seafood. Reykjavik my hometown is now seething with tourists from all over the world and seafood restaurants are very popular. One of the most popular is “Skolabru Restaurant” The Icelandic house of specialties . Oli is the founder of this cosy restaurant. Thanks for the comment Steinar. Yes, that restaurant is my baby. We changed it from an optical clinic to a restaurant. I am so happy its still one of the best restaurants in town. Well, it has the best location in Reykjavik after all. Looks like a lot of work need to be done before enjoying this exceptionally refreshing fish preparation 🙂 But it’s worth it. And you did PERFECT! Yeah, it’s a bit of work, but the prep really isn’t that bad. You can always grab a friend and get it done in half the time.